Many of us are aware of the shocking conditions that exist in state run orphanages in some developing countries, but nothing could have prepared Cathy, an experienced foster carer, for hearing about it first hand. Elaine and Ian follow the correct procedure to adopt a child from abroad but when they arrive at the orphanage they find their baby has died. Devastated they plan to return home childless but are persuaded to see an abandoned two year girl. They immediately fall in love with her. With no experience of looking after children and wanting to make up for Anna’s past suffering they give in to her constant demands and ignore her bad, sometimes cruel, behaviour. Anna quickly becomes unmanageable and when her parents can’t cope any longer she has to go into foster care. Cathy is her third foster carer in a week which shows the level of her challenging behaviour. Despite Cathy’s best efforts and years of experience it seems there is little she can do to help Anna. "Wow! Wow! Another brilliant book! Couldn’t put it down, finished in less than 12 hours…. " " One of the best Cathy Glass stories I have read ." "… another great read … no complex narrative just pure story telling ." "the best I've read yet. So glad they are now in audio format… "
"Cathy Glass never fails to amaze me with her work, I started reading this book and finished in one evening! I couldn’t put it down… "
"Another fab read couldn’t put it down!! " 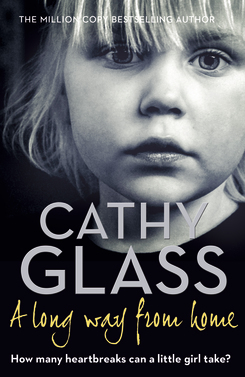 "One of the best books I’ve read…"
"… so simply yet eloquently told, and Cathy’s years of fostering experience shine a beam of light across the pages… touching, poignant tale… "
Congratulations to Cathy Glass whose A Long Way from Home is again number 10 in the Sunday Times paperback bestsellers this week. Congratulations to Cathy Glass whose A Long Way from Home is number 10 in the Sunday Times paperback bestsellers this week. Cathy Glass’s A Long Way From Home remains in the bestseller lists - this week at no 9. Cathy Glass’s fostering memoir A Long Way From Home remains in the bestseller list at no 8. Congratulations to Cathy Glass whose latest book is spending a fourth week in the charts. A Long Way From Home is Number 7 in the Sunday Times paperbacks this week. Congratulations to Cathy Glass whose latest memoir A Long Way From Home is no. 4 in the Sunday Times non-fiction paperback chart this week. Congratulations to Cathy Glass whose latest memoir, published this week, A Long Way From Home is Number One on the Sunday Times Bestsellers Paperbacks this week. Collins have bought world rights in Cathy Glass’s latest fostering memoir A Long Way From Home, the story of Anna originally brought up in a state orphanage.